An energetic hamster is powering an environmentally-friendly paper shredder by running on his wheel. And he's certainly got his work cut out for him - as he has to run flat out for 45 minutes to shred one sheet of A4 paper. 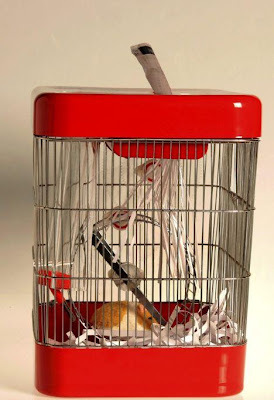 Happily, he is able to enjoy the fruits of his labour as the paper falls onto the base of his cage, providing fresh bedding for the exhausted pet. Tom Ballhatchet, 29, developed the product using a friend's hamster for his masters degree in industrial design. The London-based design consultant said: 'I wanted to come up with a product that would capture people's imagination while addressing issues of topical concern such as climate change, recycling and identity fraud. 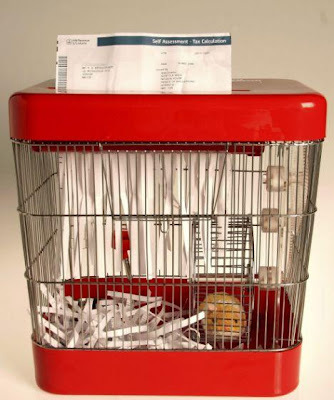 'The hamster shredder provides a solution to all of these things because it relies on the hamster to generate power, destroys confidential documents and turns paper into bedding. 'Owners can put their paper in the top before they go to bed and wake up to find the hamster has been on its wheel and shredded the paper in the process. Several companies have expressed an interest in turning the working prototype into a full scale production.